California has a long stretch of coastline with many beautiful cities dotted along it, and Santa Monica is a prime example. Located on Santa Monica Bay in Los Angeles County, Santa Monica is bordered by various neighborhoods of Los Angeles like Brentwood and Pacific Palisades, and is known as SaMo to locals. With a population of around 92,000 people, Santa Monica is a busy coastal town that attracts large numbers of tourists from all over the world each and every year. It's been a big coastal resort city for many decades and has really undergone a lot of development over the last few decades to become one of the top spots to visit on the coast of California. Some of the city's main attractions include the Santa Monica Pier, which is over a century old and features an old carousel from the 1920s, as well as various bars, restaurants, fishing spots, shops, live entertainment, and even an aquarium, as well as Pacific Park, a hugely popular family amusement park which is located on the pier itself and features a variety of unique attractions like the solar-powered Pacific Wheel, the Sea Dragon pirate ship, the West Coaster roller coaster, and more. If you're heading down to Santa Monica to spend some time on the pier or simply explore the city itself, hanging out on the beaches, roaming the streets, eating at the various restaurants, and more, a good way to keep the costs of your trip down is to stay in a hostel. Hostels are particularly popular with young people and solo travelers, but can also appeal to couples, families, groups of friends, and older tourists too due to their low costs and useful facilities. Read on to learn all about a few of the best hostels in Santa Monica. Located in a warm, welcoming building only a couple of blocks away from the Santa Monica Pier, the HI Los Angeles Santa Monica Hostel is one of the best hostels in the area. 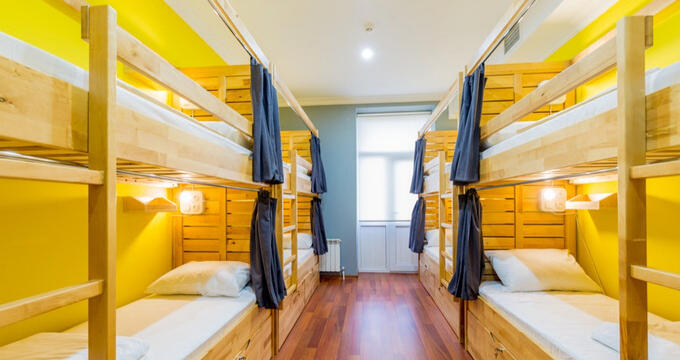 HI is one of the top names in the hostel world, and you can always trust Hostelling International to provide great standards of service and cleanliness in their hostel locations. The HI Los Angeles Santa Monica Hostel is no exception. This is a clean, safe hostel with nice dorms and private rooms also available. The dorms feature simple bunk beds with cozy bed linen, storage lockers, large windows, private reading lights, and chairs. You'll also find a spacious lounge area to hang out with other travelers, a game room with pool table, free Wi-Fi access, and even free breakfast provided as standard in the mornings. Many visitors to Santa Monica looking for a good quality hostel in the local area usually tend to head down the coast a little way to Venice. There, you can find locations like the Venice Beach Hostel, which is one of the cheapest and cleanest hostels in the surrounding Santa Monica area. You can follow the famous Venice Beach boardwalk in the direction of Santa Monica to be at the Santa Monica Pier in no time at all, while also checking out the local bars and key locations of Venice like Muscle Beach. The Venice Beach Hostel on Washington Boulevard is a colorful, stylish establishment with cozy private rooms and large dorms with lots of bunk beds fitted in to cater for big groups of guests. You'll find simple storage solutions in the rooms to keep your bags safe and out of the way, and the hostel is also equipped with a shared kitchen, a big lounge area, friendly staff, and free breakfasts for everyone. Along with Hostelling International (HI), Samesun is another big name in the hostel industry and has a large network of high quality hostel locations all around the United States, including one down in Venice Beach, just a short walk along the coast from Santa Monica. This hostel is about 20 minutes away from the Santa Monica Pier, so it's a great spot for exploring the city while also allowing to enjoy the unique sights and sounds of Venice. The Samesun Venice Beach offers nicely decorated private rooms with cozy beds, reading lamps, night stands, chairs, and more, as well as basic dorms with bunk beds and the typical hostel furnishings like storage spaces and reading lights. You'll find shared bathrooms at this location too, which also offers a large communal kitchen with plenty of cooking utensils and equipment to cater to every guest. The whole hostel is fitted out with high speed Wi-Fi too, letting you stay up to date with the social media feeds of all your friends.